· Get a holiday fact booklet from your teacher. Or you can print one out by clicking on the booklet link above..
· Click on the link below. · Enter your first name and last initial (Michael D.) in the box. · Students should click on the links and watch the videos. 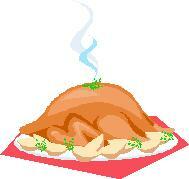 · Student A should make a list of what food items were served at the first Thanksgiving Day feast. · Student B should write down important dates and what occurred on them. Have fun and remember to work together. Record the information from your lists that you collected from the videos in your holiday fact booklet. Make sure you use full sentences. Students should click on three or four of the following resources to find more information about the holiday. Each student should make a menu with all the items listed from the first Thanksgiving Dinner. Create a picture to go with each item and color it in using crayons or colored pencils only. No markers are allowed. On the back side of the menu create a timeline describing the history of the Thanksgiving holiday. Use your holiday fact booklet to get your important dates and information for your timeline.